So the answer to my question ‘Can we keep those three fit until the end of the season’ (see below) was a rather simple ‘no’. Poor old Cesc and his recurring hamstrung hamstring. The timing couldn’t have been worse but what can you do? If he hadn’t played we mightn’t today be just a point off the top and had the ‘string not gone last night then it might have gone after 20 minutes on Sunday. As Wenger said, it’s nobody’s fault and the best thing for it is an insouciant gallic shrug, a shot of Pastis and some rest. According to the Opta stats flashing across my Sky Sports News screen (in between rather graphic images of Gerry Francis’s timewarp mullet), we have earned 2.25 points per game with him and 1.57 without, a 70% win rate against a 43% win rate, but I could get tangled up stressing about stats till the cows come home. Last season, yes: we missed his absences badly. But Nasri’s form and Wilshere’s explosion onto the scene give us extra options this year. Arshavin has screwed his head back on, Ramsey is coming back and we do – lest we forget – also have the mercurial Abou Diaby to call upon (at least for a game, until The Next Injury). What Cesc does give us is a burning will to win, the kind of which not all footballers possess, and he plays with that drive all the time. We will miss that. Who wouldn’t? Above all though, you have to feel sorry for him and for Theo. Missing a final is an occupational hazard for a footballer but it must be bitterly frustrating all the same. I’d love to see Diaby have a blinder in the final. He had that nice assist in the last one. It’s rare that he plays well for an entire game, but I’m hoping it’ll happen. Didnt u read Fab4 is injured n wont play. We can Still win it for sure but, nasri can do the job. He meant Nasri, Wilshere, and Song, most likely; point being he has Bendtner and Arshavin coming in for Walcott and Fabregas. Not a bad guess, although at odds with my hunch that Wenger might spring a Diaby surprise. Chamakh’s fallen out of favour badly, hasn’t he. I’d love to know why. I have a soft spot for him. For all his moments of forgetfulness, he has a good eye for goal and can be formidable when in his stride. Any idea where I can get hold of a cap like that? I’m hopeful Arshavin can produce something on Sunday: he had some excellent moments against Stoke despite it being a dire match, especially the work to set up Walcott in the second half. Theo really should have done better with that. 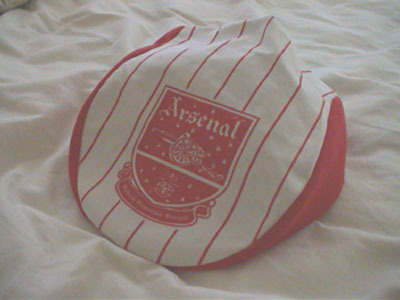 I think you can get one if you travel back in time to 1987 and go to the club shop (shed) by the Clock End. They are also doing a nice line in ‘Charlie is my Darling’ scarves.